The Company has elected to take US$6 million of the US$12 million sale price in common shares of Metalla at a deemed price of CAD$0.78. This Share Consideration represents a total of 10.1 million common shares of Metalla representing 9.9% of Metalla shares outstanding and will be subject to a 4-month hold period. GoGold maintains a very strong balance sheet with a strong cash position and no debt. The Company is in a strong financial position and seeking opportunities to be the consolidator of undervalued juniors in Mexico. The Company sold the Santa Gertrudis Project to Agnico Eagle Mines Limited (“Agnico”) on November 2, 2017 for cash consideration of US$80 million and was granted a 2% net smelter royalty on the Santa Gertrudis Project. This is the final step in the monetization of the Santa Gertrudis Project for total proceeds of US$92 million which the Company purchased in 2014 for US$11 million. PI Financial Corp. acted as financial advisors to GoGold and Fasken’s acted as GoGold’s legal advisor. 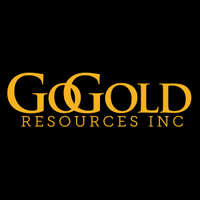 GoGold Resources is a Canadian-based silver and gold producer focused on operating, developing, exploring and acquiring high quality projects in Mexico. The Company’s Parral Tailings project produces silver and gold at a low cash cost.